The Particulars: Historical romance, Traditional Regency, Zebra, 2000, Out of Print. There is a 2005 reprint. Different cover, same publisher, also out of print. A true gentleman and handsome too, Lord Stanhope was the toast of the ton. But at the height of the Season he was rusticating to Sussex. Calista Ashton, an "elderly dried up spinster," had become the subject of a wager placed by his own foppish cousin. Now it was up to Stanhope to rescue the innocent Calista. The vicar's sister, at four and twenty, didn't care a fig for fashion -- or amour. Instead, Calista Ashton loved racing fine steeds, reading scandalous books, and embracing an independent life. Now a group of visiting London bachelors have arrived at a neighboring estate. And much to Calista's dismay, she soon finds herself being courted by not one, but two noblemen! Unused to the ton's flirtations, her head was turned by the dashing Lord Stanhope who kissed divinely. Kissed? What was happening amid the lush country meadows: sweet seduction -- or true love? "I thoroughly enjoyed this book, and it was delightfully refreshing in its approach. There is a quirky prologue introducing the characters and I can only second the author's dedication to her agent, who never once suggested it be ditched. Calista and Tristan are two witty, mature characters, absolutely amazed at the insanity whirling around them as they find peace, laughter, and security in one other." 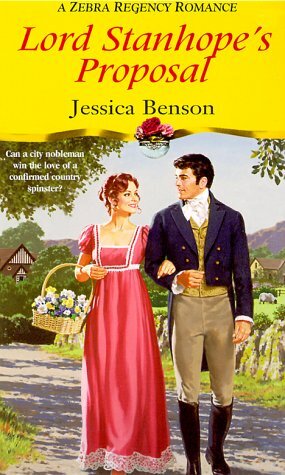 "Many Regency fans are mourning the shrinking of the sub-genre. If you need a healthy dose of lighthearted action, if you're tired of reading the same old, set-in-London stories, if you're ready for a level-headed and good-humored hero and heroine who manage to outwit everyone around them, I urge you to find Lord Stanhope's Proposal. You'll be cheering for Calista and Tristan as loudly as I did." "If you didn't read this book the first time it was released, rush out and buy it immediately. This is a comedy of manners at its best. The writing is witty, light-hearted and brimming with amusing dialogue. The comedy is both in the dialogue and the situations the various characters find themselves in." Anything Else? : Let's go back in time to the mid-00s, when the traditional Regency was dying a slow, painful death. In a bid to revive sagging sales, cartoon covers started popping up all over the place. Now by all accounts, Benson wrote some "humorous" trads, but still....cartoon covers? Really? I mean, does anybody like these? There's just something creepy and...cartoonish about them that they never appealed to me. Give me headless people any day. Also, admittedly, these types of covers usually had the opposite effect on me than the one I suspect the publishers were shooting for. Instead of me thinking "fresh and lively," I'd think, "braindead, slapstick and stupid." For every one "good" book I read with a cartoon cover, I must have read about 10 others that drove me to the nearest vodka bottle in a bid to kill off those short term memory brain cells. All of Benson's trads eventually got the cartoon cover treatment, and when the the trad lines closed shop she went on to write a women's-fictiony-chick-lit book that was published in 2007. Since then nada. I have to agree with you, Wendy, about the cartoonish covers, particularly when you're talking about a traditional Regency. But, I often don't agree with the cover artwork on novels from many genres, not just romance. I actually like the cartoon covers. And I think I've read this one and liked it. I have this one, and it's a good one. Benson also wrote "The Accidental Duchess" which is one of my favorites. She wrote with a wonderful sense of humor. It's a shame she seems to have stopped writing. And yes, Zebra had a traditional Regency line as well as a contemporary category line called "Bouquet." Phyl: I was never a huge trad reader, but my heart bled for those who were when the Zebra and Signet lines folded. I think there's still a place at the table for those stories within the romance genre....I'd love to see them come back.